Can baby koi survive winter? 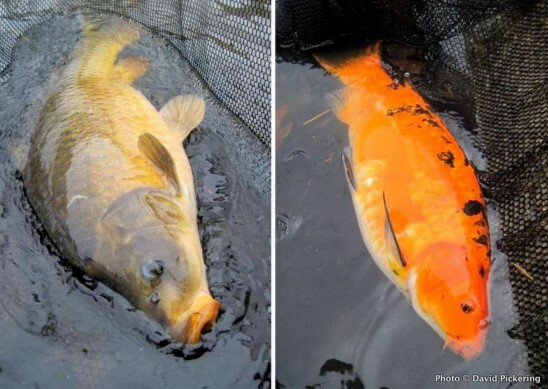 Goldfish and koi are very hardy fishes; they can survive water temperatures as low as 0°C, which means they can survive in the pond during the winter as long as it doesn’t freeze solid and they have adequate water quality and oxygen. First off, take time to breathe. You pride and joys are probably fine. They may be somewhat traumatized by the whole experience, but that would be any pet caught in an unusual situation. an issue, but their home may be in need of some repairs. You may have been completely prepared for the storm, or the storm may have taken you by complete surprise. you physically can to ensure that no further damage is done to your pond. First, you must undo all of your storm precautions to survey the possible damage. If you netted your pond, clear as much debris off the net as possible and remove the netting. Once you removed the netting you will be able to survey the damage and the condition that your fish are in. you pond, as long as the water level is normal, remove all sand bags so that you can easily access your pond. Do not get discouraged if things seem out of place, and it may not be as bad as it originally looks. Once you have removed all netting and other precautions, take time to look at the area. If any debris is present, remove it by skimming and netting. If plants or decorations are uprooted or out of place, replace them to their rightful area. If you find major damage to your pond, it is important to remove your Koi as soon as possible. several temporary options available if damage can be fixed quickly. You may want to consider using a children’s pool to house your Koi. pet store or zoo, as they may have program available to help you house your Koi until maintenance can be done. Once you have decided that only small repairs are needed, then you must focus on the water quality. You water may seem cloudy or murky due to the storm and the amount of extra water from rainfall. If the storm lasted for a long amount of time, you may be facing ammonia issues as well. Test your water for Nitrates. If Nitrates are present, add the proper amount of salt to the water. Typically you would add 3/4 to one pound of salt per 100 gallons of water. have sustained any type of injuries, it may be a good idea to add more. If you have plants in your pond, it may be a good idea to remove them before adding the salt into the water. Your fish should be the most important issue at this point, not your plants. If you are having KH issues (especially if it is below 100) you will want to add baking soda to your pond. Typically you can add 1 cup of unpacked baking soda per 1000 gallons of water. This will protect your pond from a future pH crash. Yes, I was out fishing on Monday, but it was not for stripers. Fishing anywhere along saltwater on October 29 was simply impossible today due to the enormous surf, high tides, wild winds, and closed roads. As most of you know, I have made a career out of fishing in nasty weather in both saltwater and freshwater. So, when I knew we were in for a real bad day with hurricane winds and driving rain, I just had to get out fishing. And, the best bet today would be to fish for carp in a protected spot in freshwater. The three largest carp I have ever caught (36 lbs., 36 lbs. 8 oz, and 40 lbs. 8 oz) were all taken on stormy and nasty days that were similar, though not as severe as this. I will tell you that carp just love this weather and usually go on a feeding binge during these events. It was last year during a big storm that I landed the biggest freshwater fish ever taken in Rhode Island waters, a 36 lb. common carp. During Hurricane Sandy I was in a very safe spot to fish, away from blowing trees and debris as safety is always a concern on these types of days. In fact, the wind was at my back and I had a great view of the storm while watching my rods. The rain was coming down horizontally in sheets and the wind was blowing the trees in the distance sideways as branches were coming down. And, yes, the carp were hitting as I expected they would. The first fish I landed was a 12 lb. common. Next, was a 20 lb. common carp. Next fish was the surprise of the fall for me. It was a large mirror koi that was a bright red with black spots all over it. It was a rare gorgeous fish, and this fish was only the second koi I have ever landed! Finally, the day ended with a 21 lb. common. All the fish fell for pineapple-flavored Pescaviva fished on a hair-rigged hook and fished ahead of an oatmeal-based method ball. With fully charged seas and rough and nasty weather expected for the next few days, I will keep my attention geared to freshwater, where I know I can fish. It might be upwards of a week before the ocean clears up and striper fishing resumes. Laura Irish of Middleburg, FL lost her Koi fish during Hurricane Irma. You won’t believe how she found one of them. Story from the local newspaper below. In some ways, it’s another story stemming from Hurricane Irma, but it really starts about five years ago. Laura and her husband Joel have lived on their Scenic Drive property for about eight years. After nearly losing their house to Tropical Storm Debbie in June 2012, they decided to build a new, higher house on the same parcel, which backs out onto Black Creek. “Built this house a lot higher, probably six feet higher,” as Laura began the story on Friday, talking with First Coast News. The couple currently has four hens, three dogs, and a rescue cat, but their menagerie expanded less than a year ago after they discovered a natural spring next to their driveway. They decided to build a Koi pond, knowing the constant flow of pristine water would mean added beauty with minimal maintenance, eventually stocking the pond – complete with waterfall – with 17 Koi fish and a turtle. “Super healthy,” she described the fish, “I mean, most of them are about this big,” she said, holding her hands about a foot apart. Then came Irma. Laura figured that the creek would rise. It did, not just the roughly 14 feet to the driveway and Koi pond, but another 9 feet, almost enough to reach the sub-floor of the elevated home. “Part of our prep was to put a net over my Koi pond,” Laura said, having figured the netting would keep the fish and turtle in their home. It didn’t. Several days after the water ebbed, the Irishes removed the debris-laden mesh. “So, finally we managed to get the net off and looked in. And, nothing, nothing left,” she said with a sigh. All seemed lost. In this rural area where mountains of waterlogged possessions still line the road, awaiting pickup, it’s hard to figure that any of the fish would have survived wherever nature left them. It’s unfathomable to imagine that any would have been found, but one of them was, several days later, when a friend came by. “He goes, ‘You’re not going to believe this but there’s a Koi in a swimming pool two blocks over.’ And I said, ‘That’s got to be my Koi’,” Laura said. Indeed the Koi had somehow floated and swum across at least a quarter-mile of road, forest, and other waterways, ending its hurricane-driven journey inside the in-ground pool at a home on Laurel Road. Laura and Joel know the family who lives at that home. “So, we went and looked at it, and sure enough it was Dreamsicle,” she said, identifying the fish by name. Fish and other ocean creatures face deadly conditions during a hurricane— sometimes the extreme weather strands them on land or far out at sea. How does a hurricane affect fishing? How does a hurricane affect marine life? Larger marine animals such as sharks seem to be barely affected. They can detect tiny changes in pressure as larger waves at the surface approach, as well as the reduced surface pressure associated with the storm itself, and they also swim deeper or leave the area. Hurricanes can be death sentences for coral and sea creatures that are territorial, meaning they won’t leave their homes to flee to safety, or for creatures that are slow swimmers, such as the seahorse, researchers told Live Science. Other animals, such as sharks and some fish, simply swim out of danger’s way.